As a Tier 1 supplier for several of the world's leading automotive original equipment manufacturers, Eagle Manufacturing (subsidiary of Linamar Corporation) produces 1.5 million parts per year with takt times of 30 seconds or less. The company meets these production requirements through a rigorous 24/7 production schedule supported by highly automated manufacturing systems. 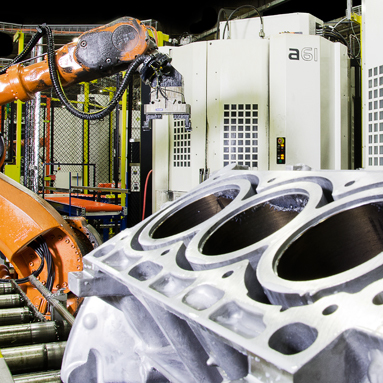 Eagle evaluated RFQ responses from several machine tool manufacturers in order to find the most robust equipment and experienced automation and integration support. To date, the company has partnered with Makino integration services to develop eight different production lines, creating a total of 20 unique cells. All automated systems were integrated within the required six-month lead-times, enabling the company to seize new opportunities during post-recession market growth. As a result, Eagle has witnessed a 25 percent increase in production over the last two years. The company’s management and engineering teams were able to continue daily production activities, receiving frequent reports on project status without speaking to multiple vendors. Machines and equipment have withstood the rigorous 24/7 machining environment, maintaining the required 99 percent uptime. The new cell control software has seamlessly integrated into Eagle’s manufacturing system, enabling communications between other cells and the company database for error reporting and rapid resolution. Based on the successful and detail-oriented integration of these cells, Eagle has turned to Makino for integration services outside of machining operations, such as automation of its leak-test system. Similarly, robots installed by other suppliers have been reprogrammed to match the user-friendly configuration of the new systems.